Safer Streets. Happier People! 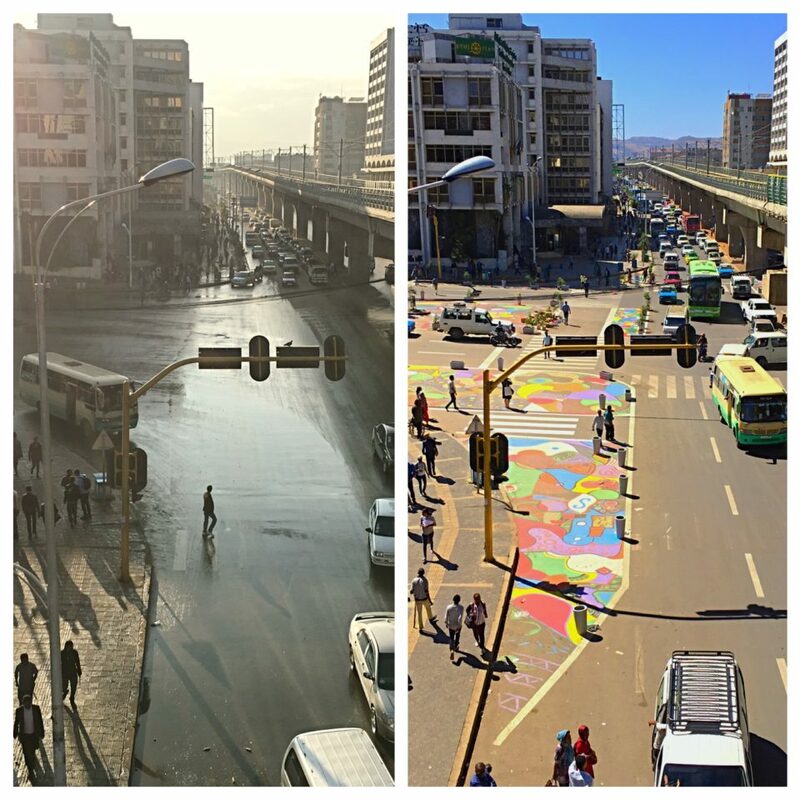 Addis Ababa goes from Perilous to Pop-Up to Permanent. Months of planning translated onto the ground plane over 4 beautiful and long days in December as over 100 people from street markers, artists, technical leads, and laborers descended onto LeGare with their tools and dedication. 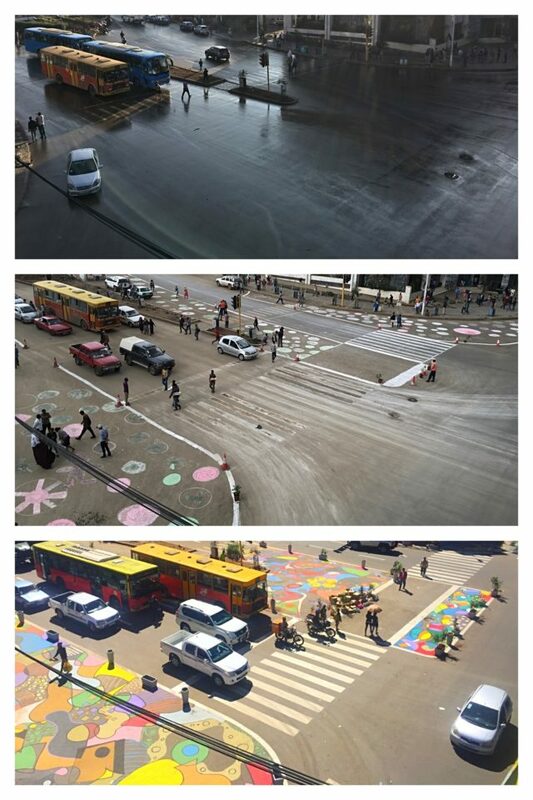 Over 750 liters of paint was poured out to fill in the newly generated public spaces. 2000 sq.m of public space was reclaimed from vacant areas, slip lanes, and under-utilized roadbed to help tighten the corner radii and shorten crossing distances. Turning radii of 6.5m was calculated and tested with the city’s longest articulated buses, while the crossing distances of ~50m were reduced to about 9.5m on each side with large refuge islands in between as safe waiting spaces. 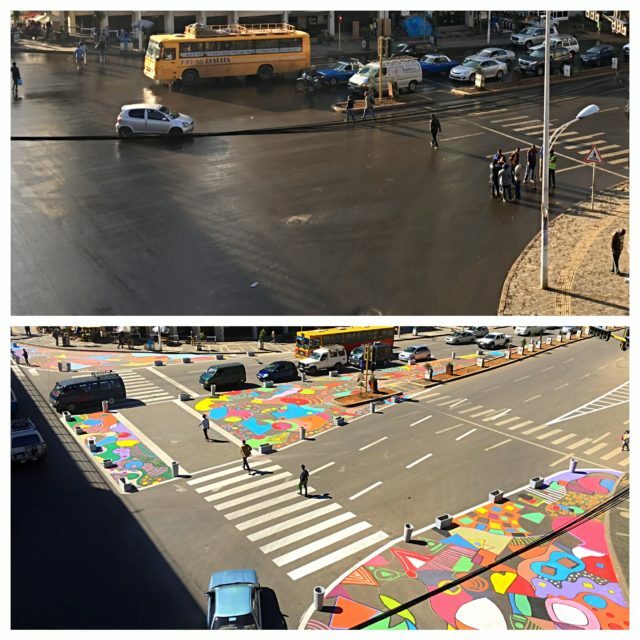 The eye-catching art work was designed and executed by the students of Addis Ababa University’s School of Fine Arts, headed by their faculty Mr. Yacob and Mr. Behailu. 3 days of unending skill by over 15 students gave the city its largest public artwork project possibly. Another 50 students from the School of Civil Engineering and the Ethiopian Institute of Architecture and Building Construction were on site collecting use and activity metrics before the transformation, and will continue to do so for a few weeks to help evaluate the project for its successes and learning before capital construction. User surveys and opinions from local business owners will further help inform the project and its feasibility. With immense support from all the various city agency heads such as Dr. Solomon at TPMO, Mr. Genetu at TMA, and Mr, Habtamu at AACRA, and our partners at Vital Strategies and others under the Bloomberg Initiative for Global Road Safety, LeGare intersection went from perilous to pop-up to permanent. And with questions like “which one is next?” and “how do we scale this across the city”, we hope to translate this into a city-wide program in the coming year.